Wow! this photo is SUPER! I love the dreamy look! Looks good in B&W. 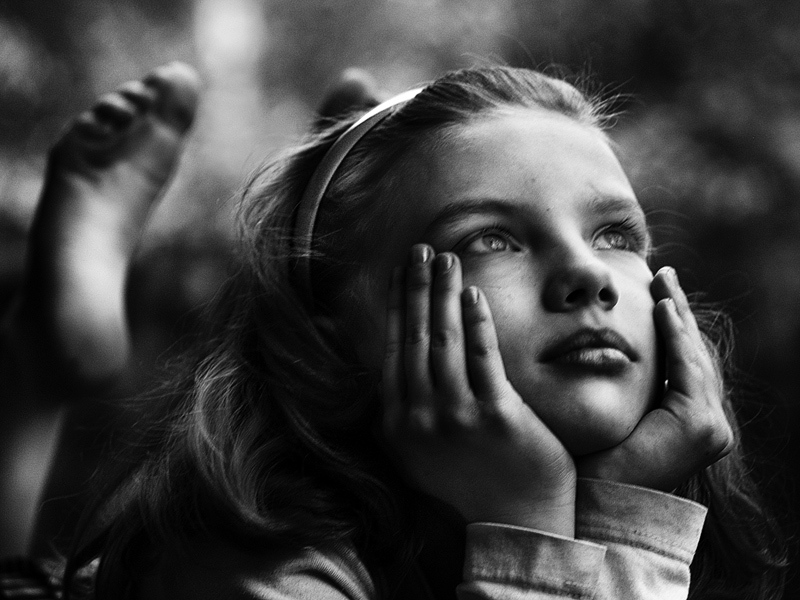 lovely expression.. dreaming eyes towards the sky.. great b&w.. so kind.. and lovely.. This could be an illustration from a children's book. She looks like a contemporary 'Alice' with that daydreaming expression on her lovely face. Congrats, I really love this shot a lot. That's great portrait. I like the tones and great DOF. Beautiful pose. Stunning portrait. Excellent DOF displayed with very good composition. Excellent mood. J'aime assez le grain, cette douceur, l'expression du mod�le et la profondeur de champ. Lovely black and white tones. Good contrast and details. A beautiful photo from you once again. Nice pov, good crop and beautiful b&w mood you created. Nice picture,Nice POV and DOF. Interesting composition with alluring light. This has got to be one of my favorite images thus far! Amazing -- I love this!! Simply amazing... Thanks a lot!!! Another great photo, ans such a pose and compo here.. congrats! Great compo, great shot! Good choice for B&W! One minor detail; in my opinion the eyes could be a little sharper. ...you can be lost in her eyes! Excelente retrato. Good composition. Congratulations. Fantastic. This is as perfect as it can get. Fantastic B&W work with excellent lighting. I can't tell you how much I LOVE this shot......everything about it! The darker tones, the BW, the almost "film" look to it! The gaze, the natural pose...etc... It has to be my SECOND favorite of all time on this site... excellence in everyway! !